All about truly and really unique jewelry. You want to go really unique with your jewelry. I do, too. But I also like animals. Just about every kind of animal. And wearing an animal like a lizard around my wrist is getting pretty unique. OK, not a real lizard, but a bangle bracelet. One that has plenty of sparkle plus looks really unusual. Yes, something makes a statement is great for me. 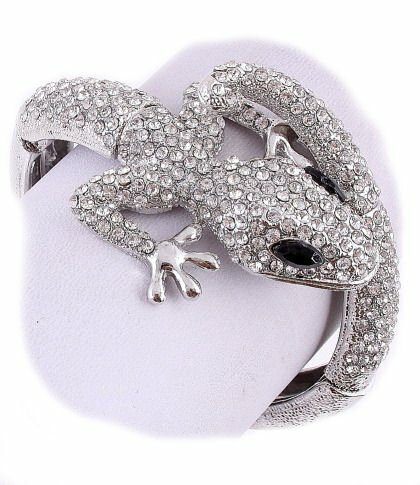 My favorites are those lizard bangle bracelets that have a bold and stunning look to them. The effect is more wrap around. So my wrist looks wrapped in a bejeweled lizard. Fun, huh? I know. It’s a statement of me being different and really unique. But I like that. I get plenty of comments, mostly compliments, but not all. For some people who see my lizard bangle bracelets, I get not quite compliments. But, that’s fine with me. If you like to have a look that is more statement than traditional, you might also like wearing a lizard around your wrist. This is more than just unusual jewelry. This is really unique jewelry. Even if lizards aren’t quite your thing, you still want to wear pieces that represents your own style in jewelry. Finding your style doesn’t have to be tricky either. Sometimes it’s just a matter of what appeals to you. Especially when you see something that you really like. That’s when you can start putting together a look that makes sense to you. For me, wearing a lizard bangle bracelet works great. It’s part of my bold style and shows off something that I’m passionate about, animals. Show off your own passions with really unique jewelry. This entry was tagged animal jewelry, bangle bracelets, bracelets, lizard jewelry, silver jewelry. Enter your email address to follow Really Unique Jewelry and receive notifications of new posts by email.